At Excellent Esthetics we are always improving. Part of this includes continuing education and attending workshops by all our staff. We are always on the lookout for new treatments & techniques. 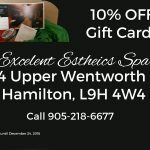 We welcome you to check in on us from time to time to find out the latest in cutting edge spa services and if they will be the right fit for you. Everything we have to offer including the newest and latest will be right here on our website. You are the important one. Our team will apply their knowledge and experience to guide you through the maze. The latest in skin care, anti-ageing treatments, botox options, fillers, and last but not least, spending your money wisely and getting the results you want and care about are what we are all about. 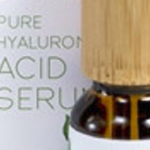 New products often appear as a result of a trip to California to see what the stars are doing. We obtain the best of the best and introduce those products to you as quickly as possible. New ultra light cluster eye extensions are a fine example of one of the latest products. They are lighter in weight and, with care, longer lasting and available at a more reasonable price. This results in making it more affordable for you to look your best not only for that special function but all the time. We are also introducing the Photon Facial. 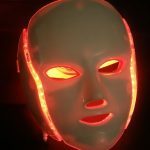 Continued research in the exciting world of LED light therapy has proven the benefits of this revolutionary new treatment. Even NASA is exploring the possibilities and benefits of this new technology. 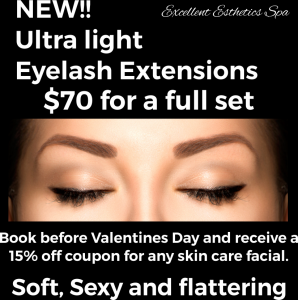 As seen on Facebook® our Love Your Lips promo and our Ultra Light Eyelash Extensions offers each come with a coupon for 15% off any facial we offer. This is a huge savings. These offers will expire. 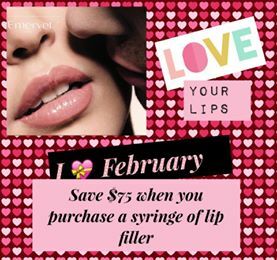 Call us today to book yours.